A few weeks ago, someone I used to call a friend, posted in a public forum that I, Angela Theresa “Curry’s Angel” Collins-Egic, am just “not that memorable”; also, I apparently “lack charisma” to boot. Since I originally penned this article (last week) — a little glitch in my life [an abnormal mammogram and upcoming needle biopsy to see if its benign or malignant] has caused me to think about memory, being remembered, etc. Two and a half years shy of my half-century mark, I’m having the longevity conversation with myself . So, as I chronicle my life, up to now and hopefully well into the next fifty or so years. He was born Andrew Martin Arnold but solely uses the stage name of Andrew Martin now. It suits him well. When we met, back in 1985…I thought he was a 17-year-old girl. Andrew would tell you the same; that he looked like a 17-year-old girl. For a few of those youthful years, Andrew did start wearing women’s clothing, taking my hand-me-downs, in fact; and marketed his transvestite image. 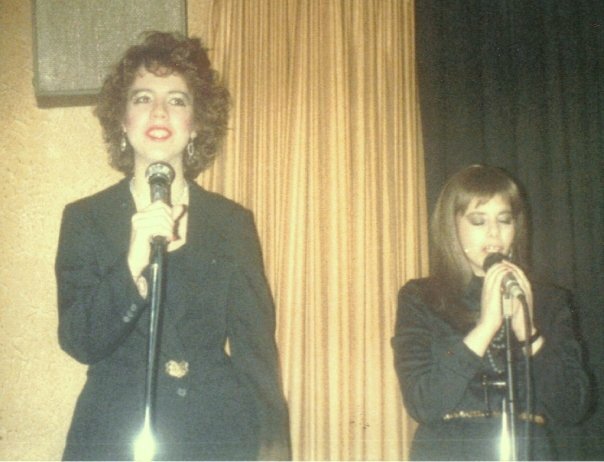 He utilized my talents and Susie “Squeaky” Schwartzberg’s talent to do two cabaret acts at a venue called Jason’s Park Royal. The first one titled: THE LADY AND HIS MUSIC. He was Miss Andrew, in every sense of the word. A talented, off-the-wall and interesting young gay man. To some degree, he and I were as close as any two friends could be. Andrew and I met at an 8th Street pizza joint called Bennie’s [worst pizza ever – yet we ate a slice every week]. The day I walked in there, across the street from 8thStreet Playhouse in NYC; on my way to see the NY showing of ROCKY HORROR PICTURE SHOW: I met these two girls, [I thought]; when the very thin, flat-chested one told me her name was “Andrew”. I was a little taken aback. The shorter one, with a tomboyish charm [yet, was obviously female] was “Barbara”. Really, they didn’t even look related. Nevertheless, they were: fraternal twins. It didn’t take long to figure out that both Andrew and Barbara were talented, intelligent teens. In fact, wise beyond their years! I instantly adored them. Through them, I met some great people, many of whom are still friends today; including Barbara and Andrew. Except, the friendship with Andrew has ended a few times and we are, as of July 2011, not on good terms . . . which is what I’m writing about. In 1985, though, Andrew, Barbara and I, and a few others became a gang of misfits, at a place where us misfits fit in. There was the “8th Street Gang [Cast]” and “us”. “Us” who wanted to be in the 8th Street cast—all of us talented enough, yet not popular enough – to Sal Piro, at least. Being that Sal is the President of the Official RHPS Fan Club and cast the floorshow (now called shadowcasts) back then. We were still misfits. We showed up every week, though, at 8th Street Playhouse – Miss Andrew, Barbara Arnold, Susie “Squeaky” Schwartzberg, Phil Dejean, Shawn Rozsa, Mad Man Mike, Andy Grondahl, Hawkeye, A.J. and many more. Since Sal seemed to have blacklisted quite a few of us from being in the popular 8th Street cast…I found us another way! I moved to Brooklyn and heard about a midnight showing of RHPS on Saturday midnight. When I heard the floorshow [shadowcast] was thrown out, I grabbed my mis-fitted friends and swooped in to have our own show. I wanted to have the best cast! A cast that would have people saying we were “as good as the 8th Street cast” or “better than”! I just wanted Sal to see how talented we were and have him, finally, offer us a role in the big show in Manhattan; or acknowledge us, at the very least. We put the show together, quickly. I had every intention of playing ‘Magenta’; no one wanted to play ‘Frank N. Furter’, oddly. Inspired by an 8th Street idol of mine, Julie Calabrese, I molded myself into ‘Frank N. Furter’. Oh yes, and my other idol, Dori Hartley. [She, Dori, had moved on with her life before I had arrived in New York, though]. Our (really, my) cast, The Low Down Cheap Little Punks, at Brooklyn’s Marboro Theater, became known as one the best casts in the East coast – comparable to Manhattan’s 8th Street Playhouse! At least, as far as I was concerned! Sal Piro eventually took most of my cast into his cast – so, that tells you something. Some of the top cast members of Sal’s 8th Street group, in 1986, got their start in MY CAST! As time went on, around 1987, when I began working in a talent agency – we represented Sal Piro – Sal and I started a professional, respectful friendship: I’ve attended many Rocky Horror conventions where Sal and I had some great conversations. My favorite was a Las Vegas convention, in the 90s, when Sal introduced me as “one of the most dedicated” fans of RHPS. Sal also put me in his 2nd RHPS book Creatures of the Night II;invited me to be part of the first television showing of RHPS at FX Studios [I went as Frank N. Furter, of course]; and Sal asked me take his RHPS items to an Albany, NY convention when he couldn’t attend. 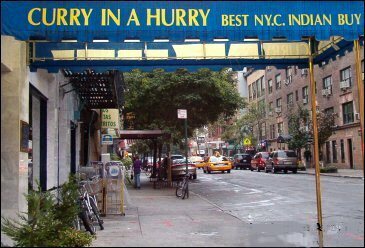 In the early years, I was at every convention from the 10th Anniversary (Beacon Theater) – and where my original costume – “Curry’s Angel” brought me Good Morning America and newspaper reporters and photographer’s interviewing me about “who” I was. Found out, later, one of the friends’ buzzing about me told the reporters that my real name was Angela Curry . . . and that I was Tim Curry’s real-life niece!!! I hadn’t even met Tim Curry, at that point! Nevertheless, the next morning, as my interview aired, millions of viewers thought I was, indeed, Tim Curry’s niece as the name ANGELA CURRY was emblazoned at the bottom part of the screen. Coincidentally, when I finally did met TC, it would be revealed how much I resembled his real-life niece. I believe she, Tim Curry’s real-life niece (he has three); one resembles me [I’m older, I believe]; she, my doppleganger Curry niece, has aged much better than me, though. About three weeks ago – on the Facebook 8th Street Playhouse page – to be told by Miss Andrew that I am “not that memorable” and that I lack “charisma”, really got up my crawl! We must also remember, after 1987, Andrew disappeared from the RHPS fan base and refused to be part of any of our conventions, get-togethers, etc. until about 2008 or 2009. 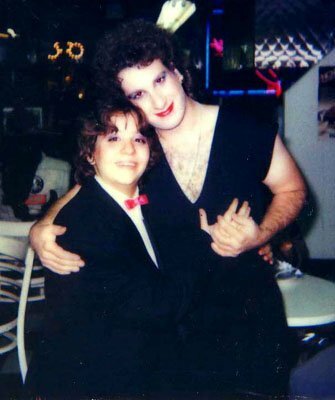 In short, while I was involved, actively from 1983 (AZ) to 1984-1987 (NY) and then from 1988-now at conventions, another stint as ‘Frank N. Furter’ in Arizona in the 90s, made a “rock-u-mentary (1990) w/the AZ group, talked to Tim Curry and had many conversations with Sal Piro, Patricia Quinn and Richard O’Brien and too many cast(s) – all the way to England – and had a RHPS newsletter – fans from as far as Italy and France writing me fan mail . . . Really?! Not memorable? No charisma? Me? Are you talking to me, Andrew? Unmemorable, little ole me? Andrew claims “more people” remember him from those days. I might agree with him about that, of course. My argument is NOT the numbers; it’s the words about a personality – no charisma, not very memorable. Are those words you say to a friend? A friend so instrumental in so many memories, my own and in his, and many others! There are people from “those days” who approach me, remember me, actually . . . whom I cannot, for the life of me, remember at all. BUT, friend or foe, I would never be so rude to say to them: “you’re not very memorable” or “you must’ve lacked charisma”. Hell, for all I know, they are very memorable and have tons of charisma – I just wasn’t lucky enough to see it and or get to know this great person at the time. My loss. Which was my point with Andrew Martin, supposedly my friend … he went on to remind me and the group how “everyone remembers him” and “hardly anyone” remembers me. A snob! An ego-maniac. A very insecure person, envious of my involvement and part of this history. Andrew missed the years between 1987-2007, when we had reunion’s, conventions and were interviewed by German, French and British TV shows and even American specials. After I blocked him on Facebook – had unfriended him months ago when he posted some rude, jealous and snobby remark on my wall – I actually just feel sorry for him. He is, insecure. He is dysfunctional much more than most of us. I claim to have empathy. Of course, without proper, professional diagnosis, I can say, from my experience (in life) – I find Andrew shows signs of classic Narcissist Personality Disorder. I had another friend with a professional diagnosis of the disorder – thus, I see the similar signs in Andrew. This means, I really should be empathetic. Yet, I, too, have my ego and insecurities, as well. I guess we’re all a bit narcissist in the theatre business! A recent scare, which I’m still dealing with calmly, made me think about . . . well, being remembered, etc. and how we are remembered. I have no fear of death, itself, yet I don’t want to do it right now. I want to see one hundred years on this earth, I mean, if I’m capable and not crippled up, etc. Yet, as I have had friends pass on – far too many for someone my age – it makes me think about who will remember me? Who will share these memories with me, of me and our times in the 1980s? If Andrew is right, and I’m not that memorable or charismatic — me being there was all, I don’t know, an illusion. I thought I finally did fit in. I had found my people – the different, the misfits, the unusual – and now, maybe I am still an alien, the kid easiest to bully, the ugly one, the forgettable one. Sure, I know it’s not true, really. Andrew is trying to hurt me to make himself feel better – for his insecurities – yet, he succeeded. As really, no one even stood up for me! I may understand why, though – Andrew will argue, filibuster – and would’ve pestered anyone who dares speak up for me. Because I spoke up for me and he went on and on until I ended it by blocking him! It just would’ve soothed my ego (of course, not my authentic self as “ego” is the false self) if someone had spoken up for me. I guess we can say Rocky Horror Picture Show also attracts insecure people all around! Yikes! DISCLAIMER: These are my experiences, shared by me, as they happened to me. People in these true event(s), may not remember them in the same way. Certain facts can be agreed upon by all parties, nevertheless. I met Tim Curry, in New York, on August 28, 1987. Beyond that, I do not, in any way, suggest, hold or express that anyone else experienced this event in any paranormal, psychic or unusual way. That is how my experience of the event(s) happened, though. It was getting very near the time I would finally meet the man! I saw signs where everywhere. Many were almost too literal. Everywhere I went I could feel Tim near me, around me. I would ‘just know’ he was in New York. A day or two later, I’d read in the gossip column that Tim Curry was seen in New York, on the very day I thought he was nearby! This feeling of knowing Tim was nearby began when Clue was released. I had missed TC by one day. I went to the theater the day before the movie opened to the public; they had the premiere (for the actors) the day before that, nevertheless. I was getting closer to meeting the man, though, admittedly. On September 28, 1984: I turned 21-years-old. 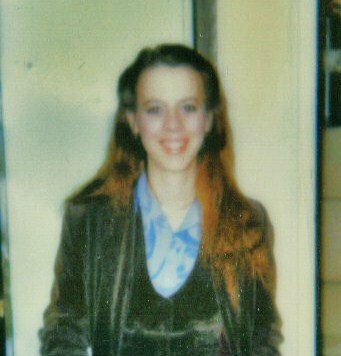 I had barely survived anorexia, had a boyfriend away in college in somewhere near Flagstaff, AZ; was living with Mom & Dad in Phoenix, AZ. Before the anorexia got the best of me, I had applied for and auditioned for NY’s American Academy of Dramatic Arts. The audition was held right there in Phoenix. October 4, 1984: I took my first airplane ride and arrived in New York City, for the first time in my life. Had a job at Macy’s in three days and began school at AADA. In about 1985: I left AADA and moved to Brooklyn with my friend, Betsy. One day, I called home to Phoenix. My father answered the phone. He was not the most observant or demonstrative man. My father, a man of 71-years-old [17 years my mother’s senior], was not terribly reliable about taking messages. Thus, if he was there and answered the phone, he’d surely forget I had called by the time Mom returned from her errands. I was pleasantly surprised that my rather aloof father would even notice my obsessions, especially from three thousand miles away! I told Daddy that I hadn’t, but hoped to someday. Dad gave me his blessing. That was a lot for my father and made me happy. Late 1986: My father had cancer surgery, went into a coma and was declared dead. My mother and I, after five neurosurgeons reported he was brain-dead, opted to turn off life support. 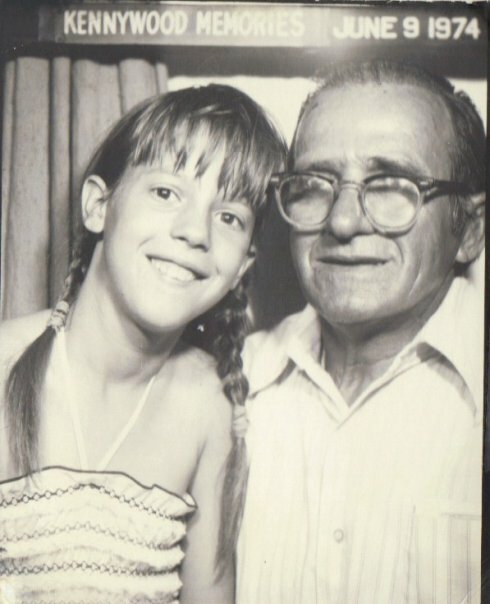 My father breathed on his own for three months, then passed away, in Arizona, on February 4, 1987. The same day Liberace passed on. My father’s spirit came to me, all the way in NY, the night he passed and he told me goodbye. 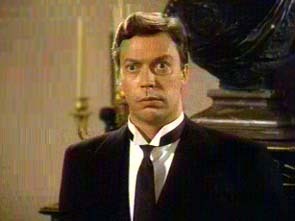 Right before my father passed, my Uncle Curly, Mom’s brother, [the uncle that Tim Curry resembled in Clue. Yikes! ], passed away. After my father, my Mom’s sister, Aunt Mary Margaret, passed on. My poor mother lost her brother, her husband and her sister all within a few months of each other. Rough year. In New York, my Rocky Horror Picture Show midnight friends/cast and I were still going strong, doing our shadowcast show in Brooklyn each Saturday. We called ourselves The Low Down Cheap Little Punks. I played Frank N. Furter and getting great reviews. Our friend in the cast, Susie “Squeaky” Schwartzberg, 19-years-old, was, like my father, battling cancer – a malignant tumor under her eye. I didn’t even tell her his last name. When I did tell her — she had never heard of him! As the reading went on, she said I’d meet him at a place with the initials MM – my first thought was the Mid-Manhattan Library. I worked near it and Tim is known for his keen interest in literature. I, naturally, spent a lot more time at the Mid-Manhattan Library. I spent some time there, anyway, as I love books, too. In the meantime, I listened in my head and my body for that vibration that let me know, rather accurately, when TC was nearby. I was walking my regular route home from work, towards Times Square, and my usual hang-out, The Marriott Marquis. Wait one minute! Hitting me, like a ton of bricks. I hung out at the Marriott Marquis, a lot – that has the initials MM! At a ‘Don’t Walk’ signal, I turned around slowly. When did that restaurant get there? I walk here every day and have never seen this restaurant, and there it was! The numbers 23 and 24 came into my head. This was June or July 1987. I almost instantly understood: I will meet TC while I am still 23-years-old and nearly 24. My 24th birthday was coming up, too, September 28th, 1987. 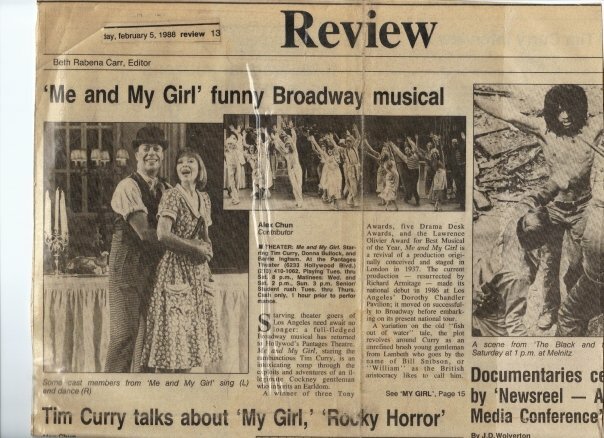 At the Times Square area, I was passing 1515 Broadway on the corner of 44th, a block before the Marriott Marquis [the Broadway show Me & My Girl was playing at the Marriott Marquis Theater]. Inside the big glass windows of 1515 Broadway, you can see the escalators to what I believed to be a movie theater. I was still feeling TC in the area and wanted to test my intuition, see if I could actually track him down this time! As I stepped in front of those glass doors this very overwhelming thought to go up the stairs made me stop and stare at the plate-glass doors of 1515 Broadway. The thought was even stronger, almost pulling me to the entrance turnstile doors. The number three (3) invaded my thoughts as well – theater number three? After about twenty minutes, I forced myself to walk away and go home, without ever following my gut feeling to enter 1515 Broadway and head to Theater 3. I talked to my father, my God and TC in my prayers. I asked God and Daddy to help me meet Tim. And I asked Tim, since I didn’t understand these signs, to show me, in my dreams, where he is exactly! I cried myself to sleep with these thoughts and prayers — to meet the only person I had ever felt such an intense spiritual connection to. I no longer believed it was just attraction. TC reminded me of something deep in my soul . . . a soul mate, yes, but more than that! A long-lost love, friend, brother, father, a voice in my very soul, a guide, a comfort and the spirit which accompanied me through lifetime after lifetime in so many ways. Crazy maybe, certainly it couldn’t hurt to meet him, to befriend him or to date him.